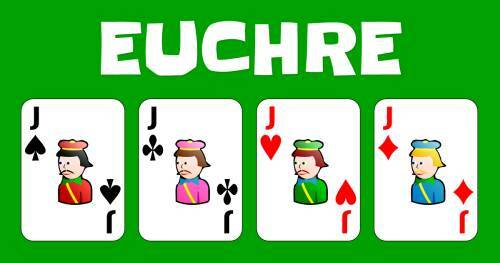 Looking for Euchre card game rules? We have shared here all Euchre rules and instructions to enable you to enjoy this game with greater proficiency with your buddies. If you have passion for exciting card games, you would definitely love to play this trick-taking card game of Euchre. Euchre is played in many variations in different regions of world and hence we have given the Euchre rules for the play which is most commonly played in social circles. It is as interesting as spades card game. An easy to understand spades game rules were given on the website before. Euchre rules are given in this post. Euchre is played with a special deck of 24 cards, sometimes with 32 cards or with the regular deck of 52 cards. We are providing elaborate card game rules and playing method with pop card game terms and definitions including spades rules, crib, bridge, crazy eights and canasta. Our posts on different rules of card games popular among kids and teenagers also details on how to play card games. Here we will be familiarizing you in detail with the rules of Euchre and its method. Would you like to know Euchre rules? Learn how to play Euchre by following some Euchre is mostly played by four people in partnerships of two with a deck of 32 or 24 or 52. It is with Euchre that the cards of jokers were introduced into the modern deck of cards. Jokers were launched in the packs to act as a best bower or top trump. Let’s play the popular version which is played with 24 cards consisting ace, king, jack, queen, ten and nine of the clubs, hearts, diamonds and spades. We have stated the Euchre rules in the further section. Except second highest ranking card, all the cards are from trump suit. Only the second highest is from the suit of the same colour as of trump suit. Jack from the suit of the same color (left bower) for instance if the highest ranking card is jack of hearts, the second highest will be jack of diamonds. The cards of suits other than trump are ranked from Ace to the number 9 cards. However, one suit of the same colour will be without one Jack as it becomes a left bower. Find below all the elaborated Euchre rules with explained popular terms and definitions of the play. Each player is dealt with five cards by the dealer. Total twenty cards are dealt and the four remaining cards which are not dealt are known as kitty and are placed in the center with face down. The topmost card of the kitty (21st card of the deck) is overturned and called upcard. Starting from the player who is at left side of dealer, each player gets chance to accept or decline the upcard as trump. Player rejects the upcard as trump saying ‘Pass’. If he accepts it as trump card, he declares to the dealer to ‘pick it up’. Once any player chooses upcard as trump, he takes it and in return discards one card to the kitty. If all players reject the upcard, players may name any suit as trump which should be other than the rejected upcard. If all players do not declare trump and give a ‘pass’, the fresh deal is played. The player who names the trump suit is called maker in the Euchre rules. The team collectively is known as makers. At the start of playing hands, the maker player has option of declaring term ‘Alone’. If he declares Alone, the partner will no more be participating in the play and will face his hand down. The maker’s team score 1 point for taking 3 tricks. The makers (maker’s team) score extra 2 bonus points for taking all the five tricks. If maker’s team fails to take three tricks or make less than three tricks, they are declared as ‘euchred’ and the other team scores 2 points. If a maker declares to go ‘Alone’ and take all the 5 tricks, his partnership gets 4 points. If he takes 3 or 4 tricks, his partnership scores only 1 point. If the defender (other than maker team), goes Alone and takes 3 or 4 tricks, his partnership gets 2 points. If he succeeds in winning all the 5 tricks, his partnership gets 4 points. The team which scores 10 points first wins the game of Euchre card game as per Euchre rules. How you liked the Euchre game or is it already your favorite card game? Wouldn’t you love to play it with your friends? Share your comments with us as you enjoy playing these exciting card games. The Euchre rules and terms stated here will surely help you to play it with mastery. Do not forget to see the rules of Phase 10, cribbage rules, bridge, crazy eights and how to play spades. We will be soon updating on other popular card games with all the rules, how to play methods and terms to make your fun time interesting. Go Fish Rules: Know How to Play Go Fish Card Game? Card game rules is a blog dedicated for all card game lovers. Our sole purpose is to help out all the card game lovers to understand the rules easily. We neither encourage gambling nor promote them.